When someone mentions “presentation” invariably Microsoft’s PowerPoint comes to mind. PowerPoint slides, and even entire presentations, can be easily incorporated into story map map tours, and can provide some extra context for your tour. In this post we’ll cover adding static “slides” as well as using Slideshare and Box for hosting the presentation used in your tour. 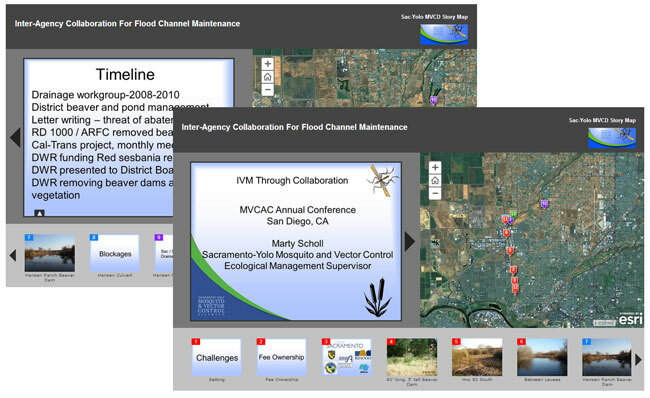 The example below from the Sacramento-Yolo Mosquito & Vector Control District uses images from PowerPoint to enhance the tour, using a PowerPoint-based introductory slide, thumbnails, and other slides along the tour to provide more details. You can capture the PowerPoint slides from your screen, or use Save As to save one or more slides as images directly from PowerPoint. Resize as necessary, and add these to your map tour just like any other image. Actual PowerPoint presentations can also be included in map tours. Here’s how using two common slide sharing solutions. For these examples we’ll use an existing map tour, a tour of the Esri Redlands campus, and add a PowerPoint presentation as a new tour stop. The same general methods apply if creating a map tour from scratch. Slideshare is a popular document hosting service. Visit the Slideshare website or view the Slideshare support topics for more information. 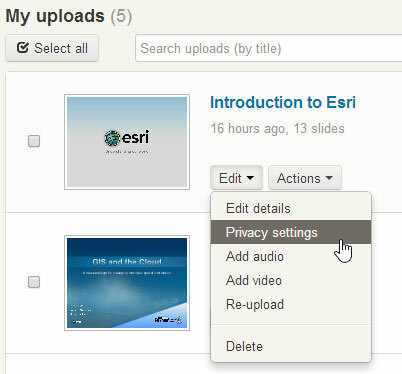 Upload your PowerPoint, and ensure it is publicly available. This can be set in the Privacy setting described in Step 2 below. 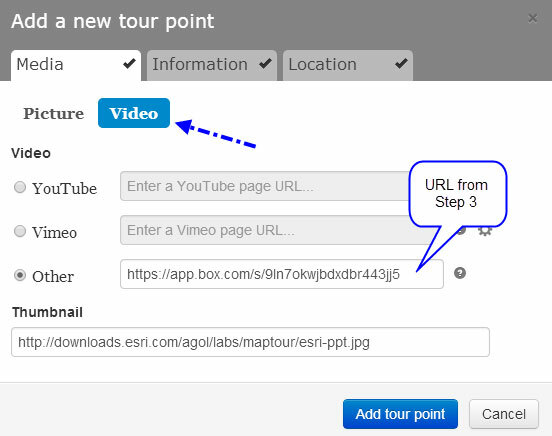 On the Media tab of Add a new tour point, choose Video, and Other. 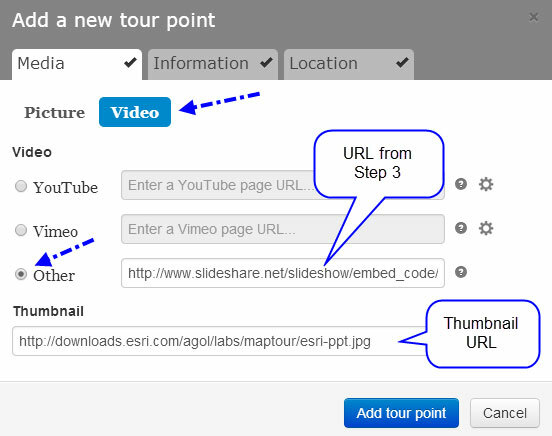 Paste the URL from Step 3 into the Other input, and add a thumbnail of your choosing. Add information about the new stop, set the location, and make other changes as desired. When finished save your map tour. 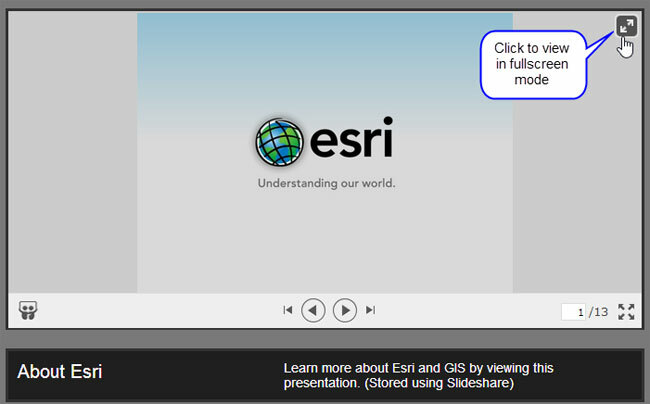 You’ve now successfully added a PowerPoint presentation to your map tour from Slideshare. You can view the presentation in fullscreen mode by clicking the arrows that appear when you hover over the top right corner. Box is a popular online file sharing and cloud content management service for businesses. Visit the Box website for more information. Login to your Box account, and upload your PowerPoint presentation. 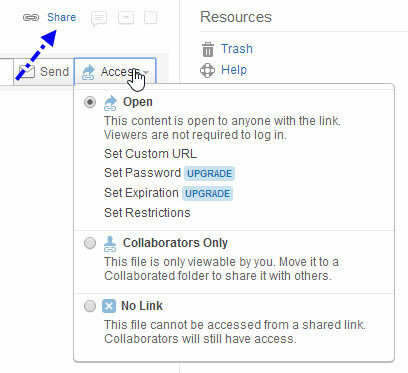 From your uploads, click Share, then Access. Ensure that your presentation has Open access, enabling anyone with the link to view it. 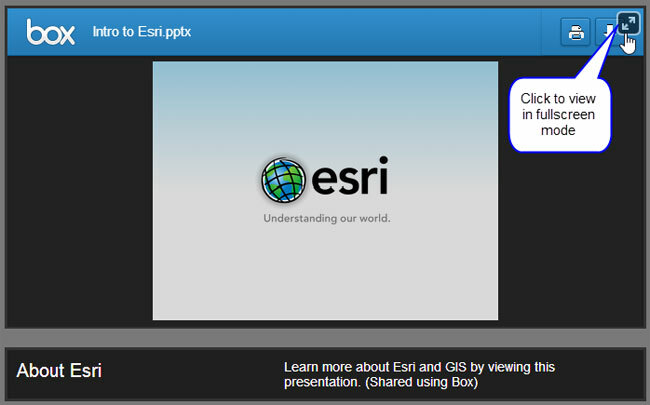 You’ve now successfully added a PowerPoint presentation to your map tour from Box. You can view the presentation in fullscreen mode by clicking the arrows that appear when you hover over the top right corner. Many other sharing and hosting solutions can be used, including OneDrive which is built-in to the Microsoft PowerPoint save options. Presentations are best when used sparingly. Like adding spice to food, too much can ruin your efforts, but a pinch here and there can bring out the story’s flavor. Keep your presentations short and to the point. This entry was posted in PowerPoint use, presentation tips and tagged PowerPoint, presentation on February 27, 2014 by pptstar.